you won't be that either. Sound familiar? 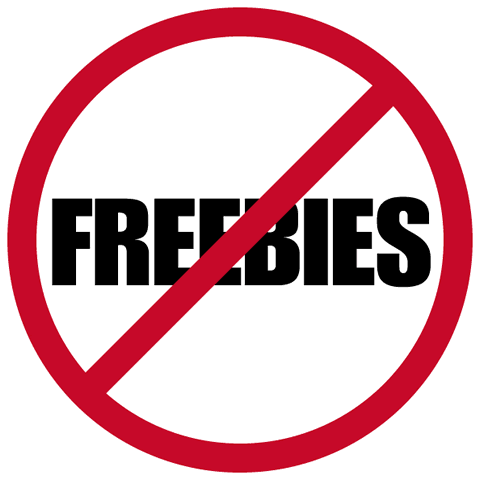 I recently sat down with a fellow excess “freebie” giver. They don’t value what they have to offer enough to charge for it. They don’t believe the other will value it enough to pay for it. They believe they can’t do without that relationship as lopsided as it may be. They feel a sense of grandiosity that they can give to others and are above needing anything in return. They are afraid that if they do charge for it, the other person will not only be disappointed but will show that disappointment by becoming beligerent towards them (how's that for living an old outdated story). Another “dyed in the wool” freebie giver told me she finally stopped after she had a realization. Since she didn’t know what it was to feel wanted for who she was, she set up her relationships to be needed. In that way, as long as she supplied what the other person needed, she felt she could protect herself from being left. This worked for her until she realized that as much as she felt needed was as much as she was being used. To add to her hurt and outrage, she realized that as soon as she stopped offering these “freebies” the other person stopped wanting anything to do with her. How do you stop giving away the store, selling your self-respect and possibly your soul, if it applies to you? Recognize you have this vulnerability. Identify those people who are by nature givers and reciprocators and give freely to them and don’t refuse when they want to give you something in return. Identify those people* who are non-reciprocators or worse, takers, and even worse, grabbers, and give to them once, but don’t do it again. *The easiest way to do this is to always respond to someone you suspect is a non-reciprocator and who makes a request of you with: “Happy to do that favor for you and by the way, that reminds me of a favor you can do for me by _____________.” The more awkward their smile and discomfort the more likely you’ve caught another one. The truly indignant manipulator after being exposed may retort, "Never mind! Don't do me any favors!" Also, if you are the one continually initiating an act of generosity to "dyed in the wool" takers, ask yourself what you’re getting in return. If your answer is truly that you don’t want anything, then congratulations you’re a Saint…or in denial.